Love it or hate it, but geolocation is present in more than 90% of apps installed on your smartphone. In fact, Touchscreen sensors, 3G, GPS and Camera functionality are four elephants on which the mobile app world is resting now. So, if you’re up to making a successful location-based service app, you’d better take advantage of these technologies. Regardless of the privacy concerns, geolocation made our lives easier. It gave birth to the wide range of mobile apps we’re using in our everyday adventures roaming through metropolitan jungles. Instagram – Social Network app, Chat. Google Maps – Navigation itself. The geolocation feature can be applied in literally any industry domain. Whether you’re running a carwash company or a corporate health insurance project. Shortly speaking geolocation performs two things: It tracks the movement of the device and reports this data to the server. Needless to say that Data is the new oil of the Digital Economy. Making use of this data may bring additional value to your company and your customers as well. So, here are five best ideas behind apps that use geolocation that you can develop. Every fisherman knows that success in his field depends on many factors. In addition to such obvious things as spinning and bait, the success also depends on a spot you choose, season, weather and time of the day. That is what we’ve found out during the development of Drophook – Web & Mobile Social Network for fishing lovers. Among other social media features, like messaging option and user profiles, Drpohook makes a strong emphasis on geolocation functions. Keeping in mind those audience specifics we’ve added an interactive map that shows users best places where they can count for a nice catch. The app allows users to pin favorite fishing spots on the map, so they could share locations with friends and find a place in future, no matter how far in the wilderness it is. We also added a nautic map with GPS navigation that will be handy for those who like fishing from a boat. This option is particularly useful in terms of app promotion, as long as there is a vast audience base of fishers who prefer the sea to shore. Location Based Notifications, so the fisher or hunter could know if started a spawning nearby. Weather Forecast pinned upon the map, in order to allow users to check weather conditions prior going to sea. This idea could find its application in any service-based business. The app can map restaurants and parking places, or you can develop a location-based discount app that will display all hot sales and discount offers nearby. This kind of applications is also popular in retail. Supermarkets and other retailers integrate GPS into their apps to help users find stores near them. The other approach is to make a location-based platform that would connect people instead of places. Surf & Yoga is a great example of apps that use location. Thanks to the power of geolocation technology we’ve made a platform for an active community of users, so they could share their knowledge in Yoga and Surfing. As you noticed the geolocation is one of the most important Surt&Yoga’s features. It helps users finding perfect spots for morning yoga with a breathtaking sunrise view or sandy bays with high waves. Location-Based Dating App that marks best places for a date, or a random place for a blind date. Fitness App that shows the best routes for day and night runs. Food Truck Finder. Think about it as an Uber for Street Food industry. More examples of mobile apps that can incorporate location-based functionality you can find in our Startup App Ideas Series. Want to create your own location-based app? Our experienced team is ready to help! 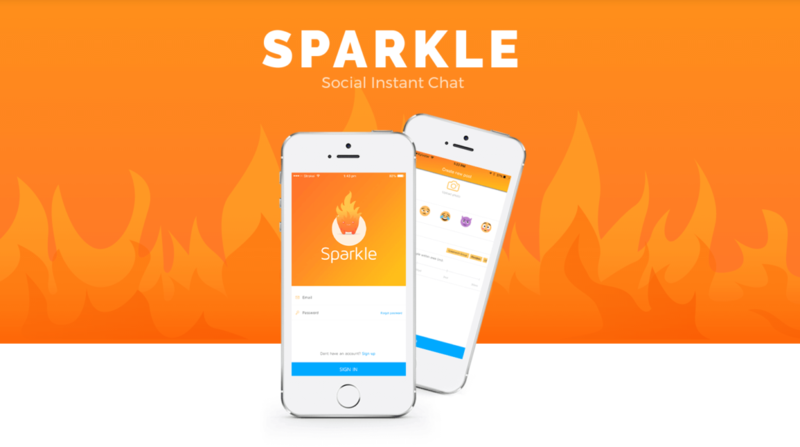 We used this function in Sparkle – Social Instant Chat that enables users to create and join public chats with people nearby. This mobile app is a location-based messaging tool that locates all users who are active in the same area and connects them via chat. In addition, by using geolocation technology, Sparkle allows users to set the radius, within which the location-based chatting will be available to others. Live Video Streaming App that will allow users to find watch what’s happening nearby. More on live streaming app development you can find here. Local Parties Finder for travelers and those who are looking for night activities. Support Groups & Sponsor Finder for disabled people or people with addiction who urgently need a hand of help. So, just for a change, let’s take a look at the platform that targets a more luxurious audience – Sea Guide – TripAdvisor for the Yachting World. The LBS platform we’ve made is essentially a crowd-sourced destination, a rating-based guide for water travelers and yacht lovers. What sets this platform apart from other is its extensive and easy mapping functionality that helps users quickly add new sites, yacht location and services. Those who are familiar with the yachting world will appreciate the possibility to add precise GPS Coordinates of their boat with exact Latitude and Longitude coordinates in place. A similar feature can be included into an Uber for Services (Boats App) we described in our Startup App Ideas Series. Sometimes it’s hard to find a place even if you have a picture of it. The easiest way is to search by picture through Google. Sadly, this is not going to work if you have a photo of bar’s interior. Turns out that making such kind of location-based app may be a great tool both for HoReCa advertisers and visitors. The advertisers could use this app in order to locate photos of happy customers as well as customers may count on gifts from restaurants and cafes for check-ins like this used to be in Foursquare app. According to the study by NYU Langone Medical Center, 58% of US smartphone owners downloaded a health or fitness app. Integrated geolocation in such applications helps users to track their workouts and patterns. Sport-lovers may, for example, take advantage of GPS data to build and monitor their walking, cycling and running routes, as well as record other activities like swimming. It’s always nice to know what weather to expect for the day in your exact location. That’s why geolocation is a must-have feature of any weather application. Besides current conditions, such apps may show short-term forecasts, for instance, for the next day or week, as well as send alerts about storms, tornadoes, hurricanes or just heavy rain. This allows users to get push notifications about unfavorable weather conditions before they happen and be prepared. Most IoT solutions have an integrated GPS so the list of options is almost endless. For instance, if you’ve always dreamed about contributing to the intelligent-built environment, you can make your city smarter by developing a mobile app that will monitor the traffic, parking, vehicles, and cargo via wireless sensors. Another idea is creating an application for smartwatches which are skyrocketing in popularity nowadays. This can be, for example, a fitness app or app for running or cycling which are users’ favorite choices. Wherever you are on the planet, there are always no less than four GPS satellites above that are in range to receive a signal from your device. In order to pinpoint your coordinates, the tech uses such process as trilateration during which your device calculates the distance to every GPS satellite by receiving radio signals from them. Essentially, there are four Google Maps APIs to choose from, depending on requirements and features you want to have in your mobile app. You can take one or use ever one of them if you have new ideas for GPS applications. Google Maps API displays map itself and allows you to change the color scheme, hide labels, use a different road density and switch between sites. In addition, you can now create a custom map style, so the map will fit your branding. Google Places API. It grants access to the detailed and categorized database of 100 million places. Google Maps Directions API. According to the latest survey, 58% of U.S. adult smartphone owners use their devices to look up directions. Along with directions, this API allows users to choose transportation mode or take multiple modes. Google Distance Matrix API. It estimates travel time and distance based on a destination set by a user, traffic condition, and suggested routes. All of these Google Maps APIs has dedicated versions for Web, Android, and iOS. If you have a great idea of location-based mobile app, CONTACT US straight away and CONSIDER IT DEVELOPED! MARKETING MANAGER Apart from her extreme marketing and public relations expertise, Ira's positive energy is making her a valuable member of our team. Marketing intuition, experience, strong communication skills, and sales knowledge are just a few of her talents, not to mention her ability to learn and comprehend new and complicated technologies. Irina is a rare combination of expertise and talent. Location-based apps improves local business communication and maintain customer relations using notifications. Thanks for sharing such a great post. Native, Web or Hybrid Apps? What App to Choose in 2019?